KEEPER OF THE SNAILS: Silk Dress. A lovely material is silk. i love the really old silk especially old chinese silk. 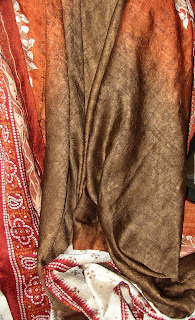 I was fortunate enough to discover a beautiful old cream silk scarf in an op shop many years ago. It has appliqued violets at both ends and luxurious fringes. I paid $3.00for it. I also have an antique cream silk jacket with embroidered irises. I remember that about 30 years ago you could buy beautiful hand stitched Japanese silk kimonos for next to nothing. I've just realised, Anne, that I bought the dress from Melbourne - from Matilda's Place. It sounds like Melbourne is full of wonderful exotic antique things. Your scarf and and jacket sound gorgeous - all that embroidery and applique must have been hours of work. It is so great not to waste this stuff...and I also like the idea that these clothes have a history. Sometimes I'd love to know what it is. How could I forget - I haven't stumbled across Matilda's, but there is a wonderful silk shop in Royal Arcade in the centre of the city. They sell reasonably priced silk shirts, jackets etc. and the designs are very attractive. Not antique though. Lovely piece of writing Clare. Maybe you are like one of those silk moths, you have to wait in your cardiganed cocoon, until you are ripe to emerge and fly in silky warm skies. Heh - thanks for the tip Anne, now I'm just going to have to come to Melbourne on my 'world tour'. Yes, Jem, 'cardigan' has such an unglamorous image, doesn't it? It looks a bit frumpy even if you're the first lady (IMO). Wow!! Your silk dress is looking so nice!! Thanks for sharing this! !